Renewable energies are meant to cover a large share of the future electricity demand. However, the availability of wind and solar power depends on local weather conditions. In this article, we analyze the impact of the stochastic availability of wind and solar energy on the cost-minimal power plant mix and the related total system costs. To determine optimal conventional, renewable and storage capacities for different shares of renewables, we apply a stochastic investment and dispatch optimization model to the European electricity market. The model considers stochastic feed-in structures and full load hours of wind and solar technologies and different correlations between regions and technologies. Key findings include a lower value of fluctuating renewables and higher system costs compared to deterministic investment and dispatch models. Furthermore, the value of solar technologies is--relative to wind turbines--underestimated when neglecting negative correlations between wind speeds and solar radiation. 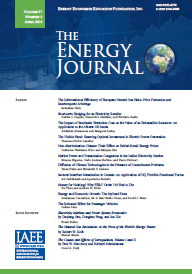 Published in Volume 34, Number 4 of The Quarterly Journal of the IAEE's Energy Economics Education Foundation.